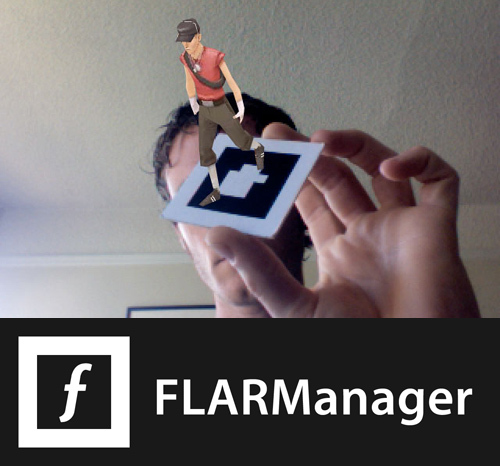 FLARManager is a lightweight framework that makes it easier to build augmented realityapplications for Flash. It is compatible with a variety of tracking libraries and 3D frameworks (listed below), and provides a more robust event-based system for managing marker addition, update, and removal. It supports detection and management of multiple patterns, and multiple markers of a given pattern. Please note, FLARManager does not yet provide compatibility between flare* and Away3D/Lite, Sandy3D, or Alternativa3D. If you find FLARManager useful, please consider a wee donation to help me make it even more useful in the future. Thanks! I’ll try to keep the download link pointed at the most recently released version. The FLARManager distro also includes the FLARToolkit library and SWCs for all supported 3D frameworks. If you want to keep on top of things, you might want to update those on your own (via the links on this page). I’ll be keeping the tracking libraries pretty fresh, but I’m not focusing on 3D framework development so those libraries will likely get a bit crusty. Note: FLARManager is built to compile to Flash Player 10. there is a Flash Player 9 version available here, but it’s based on v0.1, and i don’t have plans to upgrade it. I highly recommend you update to Flash Player 10 if you haven’t already. GPL License: FLARManager can be used for free under the GNU General Public License, v3. Source code of applications using FLARManager under the GPL must be provided free of charge on request. Commercial License: Source code of FLARManager applications can be protected with a commercial license, offered exclusively by ARToolworks. Applications using the commercial license do not have to provide source code, but must pay a licensing fee. Contact ARToolworks at sales@artoolworks.com for more information. Take a look at the Quickstart on Inside FLARManager. The FLARManager distribution comes with a number of tutorials, accessible via the nav bar above (click on the FLARMANAGER (FOR FLARTOOLKIT) link), and also a number of more specific examples. 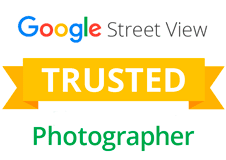 You can also findfull documentation here. Additionally, there are a couple of forums with some lovely, friendly folks on them who can help you get up and running. ARToolworks hosts a FLARManager-specific forum, which is better at archiving questions and answers than the comments on this blog. There is also a FLARToolkit Google group, which is a good place for more general FLARToolkit and Flash-augmented reality topics. FLARManager gives access to both 2D and 3D information about detected markers, which provides a wide range of opportunities. Have an interesting project you created with FLARManager? Let me know and i’ll post it here! You can take a look through this page to see a list of noteworthy projects created with FLARToolkit and FLARManager. Diego Gopen authors ARVertising, a blog that follows trends in AR in marketing and advertising.